Muffins, scones, and quick breads are very versatile and can easily be changed to reduce or eliminate cane sugar. (not cookies though....!) You can begin by replacing the sugar in your recipes equally with honey - or 1/2 honey and half the equivalent of stevia. Breads like the extra moisture of honey or agave nectar and bake up fluffy and nice with liquid sweeteners! You will find though that if you put too much stevia it begins to taste like stevia and not sweet! I have found that you can decrease your sugars a lot in these recipes - in fact I ALWAYS start by cutting the sugar in muffin recipes in HALF! (even when I was using cane sugar!) They are still tasty and you don't miss the sugar at all. Less sugar is good - even if you're talking about natural sugars! Also - any time it calls for water you can sub juice (orange, apple - whatever you have) and decrease the other added sugars. It is NOT so easy to convert when you are making them GF AND Egg Free AND Sugar Free! The best way to do that is to find a recipe that only needs one thing changed - ie sub only the flour for GF baking mix - or only the egg for egg replacer - or only change the sugar. HOW TO USE THIS MIX: Measure this flour using a kitchen scale. 140 grams = 1 cup of regular flour - then also add 1/4 tsp xanthan gum to your recipe.Where to find flours: The cheapest flours are found in the asian store! This picture is of the best and cheapest I've found. Superstore also has it sometimes in their imported foods. ISN'T THERE GLUTEN IN GLUTINOUS RICE? Nope! Glutinous rice / sweet rice / sticky rice - it just has more starch. CAN I USE THIS FOR ALL MY BAKING? Nope - gluten free is different - different ratios for different foods. This is for quick breads. (ie breads that are fluffy and leavened with baking powder /soda) See the sweets and treats - cookies and squares page for a cookie flour mixture! Add wet ingredients - and stir well. You may have to press out lumps - the GF mix doesn't mix as well - but be sure to leave some lumps too! Scoop onto hot griddle as usual! These are excellent with grated apple and nutmeg or blueberries! I'm not sure why biscuits are so hard! After MANY failed attempts at gluten free biscuits I've found one that is good! 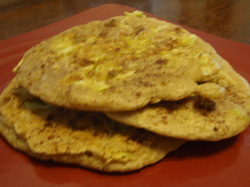 The secret is buckwheat flour! Rub the margarine in with the back of a spoon. Add enough milk to make a dough . Drop onto a greased baking pan and bake at 375' for 10 min. or until they're cooked in the middle but not overcooked. My daughter liked them! SUCCESS! 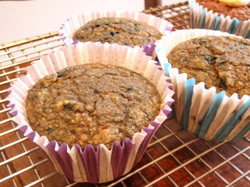 Put dates and raisins into hot water and set aside. Puree the date mixture with the banana. Add the milk. Bake at 350' 20-25 minutes until a toothpick just comes out clean. These take quite a long time to bake - don't be concerned if it takes longer. 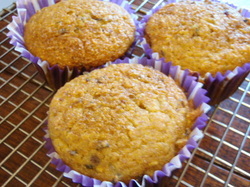 This is my long time stand by muffin recipe! I found it in Company's Coming Muffins book but have since removed all the sugar! I have changed, adapted, made variations - they always work! Puree the orange, juice and dates. If you want chunks of date - put the dates in the blender after the orange has blended! if you don't want to see dates just keep blending! Add the egg and softened margarine to the blender and whir it really well. Mix the dry ingredients and fold in the wet ingredients. Bake at 350 15-25 minutes until a toothpick comes out clean. These are soft and spicy and delicious! 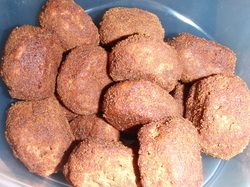 I found the recipe here - she has a recipe for a glaze - I just mix up spiced sugar. Mix "milk" and ACV, Set aside. In a saucepan mix pumpkin, sugar, vanilla and oil. Heat over low heat and stir until the sugar dissolves. Add the egg replacer mixture and "milk" mixture and stir well. Heat just until warm. Whip the liquid ingredients on high until frothy. Mix wet ingredients into dry ingredients - but mix as little as possible!! Spoon into mini muffin pan. Mix some powdered coconut sugar (just grind it in a coffee grinder!) with sugar and / or nutmeg. (I think I did about 1/3 cup sugar, 1-2 Tbsp cinnamon and some nutmeg.) Put this in a bag. Put the donuts in a different bag from the sugar. Dump donuts into sugar bag and shake. Dump them onto a wire rack over top of a baking sheet. These were delicious! I made them with homemade egg replacer that I whipped first. Mix wet ingredients and add to dry ingredients. Gluten, Dairy, Egg and Refined Sugar Free! YAY and its a success! makes 12 muffins - I don't use loaf pans because its too hard to get it cooked in the middle before its overcooked! Beat the bananas until they're pretty much smooth. Add the oil, honey and vanilla and mix well. These are crispy on the outside and nice and fluffy. I use the egg replacer recipe on the Misc. Page! Mix the egg replacer and water and whip with an electric mixer until its thick. Cook in a GREASED waffle iron. I set a timer for 2 min. 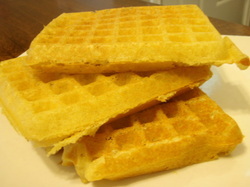 and they're perfect - the waffle iron light comes on later and they're very very crunchy! - GF, DF, SF - low carb! We have added eggs back to my daughter's diet but now we're lowering carbs! These pancakes / waffles are delicious! You'd never know they were gluten free, and since they are made of quinoa and buckwheat (no - buckwheat is not wheat and it has no gluten! flour they are low carb & high protein! Mix the dry ingredients together. Put the butter on top. Mix the milk, water and yolks to combine. Add to the dry ingredients and mix JUST until combined - do not over mix. Beat the egg whites and fold in carefully - do not over mix. Spoon onto a hot griddle for pancakes or pour 1/2 cup into a hot oiled waffle iron. A simple, delicious breakfast - throw it in the oven! Mix dry ingredients. mix in chia gel, margarine and milk. 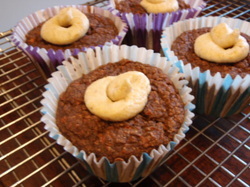 I recently baked these in muffin papers for an early morning travel breakfast! Bake at 350' for 30 min. 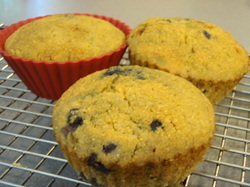 Oat flour muffins sweetened only with fruit! Puree applesauce, raisins, and orange peel. If you don't want raisins to show just keep blending! Mix in the rest of the wet ingredients. Fold wet ingredients into dry ingredients. It will seem very wet - don't worry! Bake at 375' for 25 min. or until a toothpick comes out clean. Let sit in the pan for 10 minutes before removing to wire rack to cool. Next time I'll add a Tbsp of ground chia to see if that helps. 1 1/4 cup almond milk mixed with 1 Tbsp vinegar - let sit 3-5 min. Whip the sugar and margarine. Add the egg replacer and whip well. Add all dry ingredients and sour milk. Mix. Bake at 400' 15-20 min. until cooked through. Yield: I got 16 muffins. Mix all the ingredients. Stir well. Bake in muffin tins (greased) at 350' 15-20 min. or until golden and set.